This week in the world of business has been dominated by massive trade deals and bitter trade disputes, with this post suggesting that a link between the two is that the outcome of these developments portrays a vision for those British voters who voted to leave the E.U. of what post-Brexit Britain will look like. In what is proving to be a great advert for the E.U. and its members not following the path of the British (a message sharply delivered by the French and German electorate this year, despite the rise of the AfD), the plight of Canadian company Bombardier is, for a variety of reasons, bringing the reality home to the British in a remarkable way. 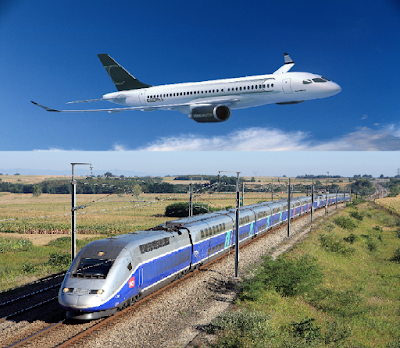 In this post then the focus will be on the ongoing trade dispute between Bombardier and Boeing, which is quickly elevating into a political catastrophe, and the merger of French company Alstom with its German Counterpart Siemens (leaving Bombardier in the cold), which in itself demonstrates the capability that exists within a conjoined economic bloc to counteract the effect of a larger foreign rival. Firstly, it is worth starting with the case of the rail network, because the merger between Alstom and Siemens demonstrates the sentiment that the British electorate voted to leave last year. Then, in the next part, we will look at the effect that the decision is having, with Britain being cast out into the wilderness without support and her trade ‘rivals’ recognising that fact. Alstom is a French company and one which carries a lot of nationalistic pride, with its consistent breaking of barriers within the rail industry with its trademark ‘TGV’ trains that any visitor to France will recognise. In Germany, Siemens’ ICx trains are also recognisable across the country, and represent a push by the German company to put itself amongst the elite companies in the field. However, these two European pillars of the rail industry recognise, quite rightly, that on the horizon stands a foreign player that will, undoubtedly, alter the rail industry beyond recognition, and that company is the Chinese State-backed ‘China Railway Construction Corporation’ (CRCC). The CRCC is much bigger than its two European competitors, and that standing is set to rise significantly with CRCC’s involvement in Xi Jinping’s ‘Belt and Road’ project. This is a fact that has weighed heavy on the Boards of these two European powerhouses, and as a result they have decided to make use of their proximity and legal/political connections to merge, in a deal which sees the German company take a slight majority in the new company and also sees the French Government liquidate its 20% share in Alstom; the looming threat of CRCC is clear to see in the statements of connected officials today, with Siemens CEO saying that ‘the facts are that there is a dominant player’. For Bombardier, which has a considerable interest in protecting its position from the irrepressible CRCC, talks between it and Siemens had broken down during initial negotiations, which led the way for the Siemens-Alstom merger, although reports at the time of writing suggest that the French Government are keen to facilitate a deal which sees Bombardier join forces with the new merged company to ward of CRCC. For the rail industry, the perceived dominance of CRCC and its impact upon the market is absolutely real, with its rate of production over the last few years far outweighing all of its competitors and its revenue streams being projected as accounting for double that of the new Siemens-Alstom company. However, this post is posing the scenario that this deal represents the benefits of staying in the E.U., which it does in terms of the company’s positions but, to provide some balance, it must be acknowledged that the deal has had a particularly poor reception in France, with opposition politicians and Trade Unionists denouncing the deal as ‘selling us down the river… [the deal has not created] a European champion, but a German champion’. Apart from clearly representing a mistrust in Macron’s pledges that the deal is set up to protect French jobs, the sentiment expressed by the French opposition shows that there is certainly no unity in the French adherence to the European ideal, despite Macron’s impassioned speech on his vision for a greater and more unified European Union earlier this week. Yet, the membership within an economic bloc does make these sorts of economic and political moves easier to complete, which translates into an ability to be flexible and protect oneself against the actions of a foreign state that owes no such loyalty to one’s position – the U.K., and particularly Theresa May, is this evening contemplating that very sentiment. A trade dispute between Boeing, one of the world’s leading companies and one half of the aerospace duopoly (alongside Airbus), and now Canadian-owned Bombardier has been brewing for some time, particularly since Bombardier signed a deal with Delta airlines in the U.S. to provide them with up to 125 single-aisled ‘C-series’ aircraft, with the contract suggested to be worth upwards of $5 billion. However, shortly after the deal was announced Boeing claimed that Bombardier were ‘price dumping’ which describes the firm selling the aircraft to Delta for an incredibly low price which then, according to Boeing, distorts the market for other participants. Boeing also asserted that Bombardier had benefitted from state aid, from both the State of Quebec for $1 billion and the British Government for a £113 million loan. As a result of these processes, the complex claim was recently heard by the U.S. Commerce Department and, as a result of their findings, the Commerce Department found that Bombardier was in breach of a number of aspects and as a result would be subject to a duty of 219.63% on its products sold in the U.S., which effectively prices the firm out of the market and raises the cost of their products by almost three times. The case is being deconstructed by onlookers at present, but for us the political angle to this particular case provides for a fascinating insight. Bombardier was founded in the 1940s in Quebec, but in 1989 it acquired the Short Brothers Company which has a huge presence in Northern Ireland, which means that now Bombardier employs over 5,000 people in Northern Ireland. It is at this stage that the haphazard political environment in the U.K. comes to the fore, because the Democratic Unionist Party (DUP), a party which Theresa May had to incentivise to prop her Government with £1 billion after her catastrophic decision to call a snap-election, recently pushed Theresa May into attempting to force this ensuing issue with Donald Trump, in order to protect Northern Irish jobs. However, Theresa May found that as the U.K. propels itself into the political wilderness, her political standing is in tatters and a friendly détente was no match for Trump’s adherence to his nationalistic ‘America First’ set of policies – the decision of the Commerce Department revealed for May, in one foul swoop, the sway she holds with her American counterpart and, in admitting that she is ‘bitterly disappointed’, it is clear that she knows this. Britain has responded by threatening Boeing with its access to British defence contracts, but whether this particular Government has the fortitude to see that threat through is another matter entirely. One thing is for sure however, and that is someone who voted to leave the E.U. and was not sure of the outcome can be in no doubt now that the decision has caused a set of events which leave Britain at a distinct disadvantage. Overall, the claim will be made that these sorts of events demonstrate that the Conservative Government are not handling the Brexit process well, and that another route is preferred. However, the result last year set in motion of chain of events which will lead to the deterioration of the U.K. on the world scale, and as Theresa May would have read the decision of the U.S. Commerce Department, she would have known that explicitly. In a world where there are a number of competing geo-political pressures like the advancement of China, the BRICS nations, and the increasing nationalism in the U.S., the British decided that they could navigate such choppy waters alone. Whilst that was clearly a dangerous decision, the lack of common sense referenda principles i.e. two referenda spaced apart so that people like Nigel Farage and Boris Johnson could be held accountable for their lies, is proving to be the biggest decision in recent British history. Perhaps, thinking ahead slightly, the position of the City of London in these U.K.-E.U. negotiations and the system created once the U.K. formally leaves the E.U. will be the clearest indicator as to how the U.K. will survive post-Brexit; the City is the only thing that will keep the country afloat because, politically, the Country is losing its clout on an almost daily basis. Yet, a recent survey that suggested that up to 10,000 jobs will be departing London as a result of Brexit should make for particularly uncomfortable reading. There is a blind adherence to the decision taken last year without any questioning of the process involved, and moving forward that must change; Brexit is the clearest example yet that those in charge do not have the best interests of the Country at heart, and no amount of downplaying of one of our political elites standing in front of bus portraying an absolute lie will change that fact.